Can you park your car in a bike lane? 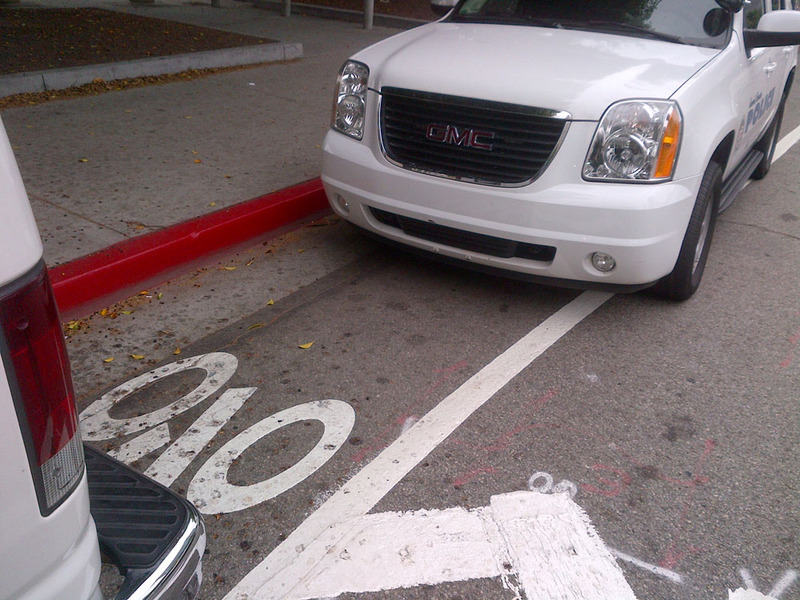 A car parked on the new Los Angeles St. bike lane. Taken on a Friday morning. It’s been a little over a week since the installation of the new bike lanes on Los Angeles Street in downtown L.A. Riding in from Echo Park, I usually take Los Angeles Street to get to work and back home every weekday, and so far the addition of these bike lanes have made my commute slightly more relaxing as I’m not competing for road space with drivers. However, when approaching Union Station before hitting Temple St., there seems to always be a slew of cars parked and stopped right on the bike lane in front of the Police Department building, red curb or not. I don’t think I’ve ever seen this section of the new bike lane clear, as cars are even parked on the lane overnight. Police car parked on bike lane. Car parked on bike lane. Two men unloading cargo with their vehicle parked on the bike lane. Within the span of three days, I sat in front of the Police Department building for a few hours each day to study how this obstruction was affecting cyclists who were using the new bike lane. During my observation, most cyclists were able to merge back safely into the normal traffic lane with the exception of one cyclist who was almost doored by the owner of one of the parked vehicles, and two cyclists who were almost hit by approaching traffic. Was the officer in a sense not “blocking” a cyclist from continuing on the bike lane? What exactly is “blocking” a cyclist? Does that mean cars can park in bike lanes as long as they leave space for cyclists to turn and continue ahead? If bicycles are vehicles that share the roads with cars, the same safety rules apply when there is a car parked in a lane that you’re driving in. Stop; carefully look behind you, go around when safe. As much as there are risks in driving a car, motorcycle, or scooter on the streets of LA, bicycles share their risks as well. Common sense bicycle safety is something that a lot of bicyclists need to learn. I have no problem with police cars parked on red curb outside a police station or when they are on duty, but I have a serious problem seeing them parked on red curb for lunch or coffee. That is a very common scene in Chinatown, for example. And I totally agree that cyclists must do their part too. I have lost count how many times I have seen them (no matter solo or as a group) blowing though a 4-way stop intersection. Having to unclip and re-clip the biking shoes is not an excuse. If he wasn’t a cop he’d get towed for parking in a red zone. While on duty and doing work related tasks, cops can park anywhere they choose, including blocking traffic lanes – I’ve seen them block “fake lanes” (peak period travel lanes) many times, which is always interesting when cars have to merge around. If they are blocking the bike lane to get food, then that shouldn’t be allowed. The cargo people should be ticketed, same as if they park in a red zone. Red zones are no stopping zones (except for buses when designated) and as such, loading and unloading from them is not OK, although if the car is attended it really doesn’t matter because they will just drive away when parking enforcement rolls around. Goes to show Police don’t care where they park. They should follow the laws and posted signs and street markings regardless! Good Post Jung! Maybe they will get a chance to see this and realize they’re only making it harder for cyclists on the road! I’m sure Metro wouldn’t do the same! @Jason Leung – Have you also lost count of drivers’ minor traffic infractions? Exceeding the speed limit, rolling through stop signs, etc. I think that pretty much everyone on the planet (drivers, cyclists, pedestrians, and others) are guilty of relatively-minor traffic infractions.It irks me when folks, including you, fall into a double standard, pointing out bicyclists’ less-than-perfect traffic behavior as if it’s something unusual, as if something different than what drivers do all over the planet ever day. When drivers raise a concern (ie: the 405 is congested so let’s spend another billion to widen it), have you ever brought up the point that drivers “should do their part” and stop their unlawful behavior? I’m sure if people parked their bicycles on normal traffic lanes, drivers would be furious! Why are cars even allowed to park on bike lanes anyways? Does that not devalue and defeat the puropose of having a bike lane in the first place?! If you’re going to spend tax-payer money on bike lanes, place laws into effect so they can get used! 1. Drivers license – remember it is a privilege, not a right to drive. A license to drive is essentially a tax. 4. Sales tax on car maintenance and repairs. A new tire, sales tax. New brakes, sales tax. Oil change, sales tax. Car drivers put into the street system more than bicyclists. Therefore, they have the highest priority in the roads. Shouldn’t the bright red curbs make the fact that it’s also a bicycle lane a moot point? And the police should be allowed to block the lane if they’re on police business, but not for donut calls. I don’t have access to a Flickr account at the moment. You’re welcome to upload these photos on your personal account if you’d like. I don’t follow your logic here. The fact that in California, we require a license to operate motor vehicles on public ways but do not require one to operate a bicycle (or to walk, for that matter) would seem to imply, if anything, an *inferior*, not superior, right to travel for motor vehicles vs. bikes. In reality, both modes of travel are subject to the same rules regarding right-of-way (check out California Vehicle Code Section 21200), independent of whether the operator is required to obtain a license or not. Fuel taxes go mostly toward the construction and maintenance of a massively expensive highway infrastructure that bicyclists generally aren’t allowed to use. A portion of state fuel taxes get returned to local municipalities for road maintenance, but it tends to be a small percentage of each city’s overall transportation budget, which is funded overwhelmingly by revenues from property, sales and other taxes that are a) paid by drivers and non-drivers alike and b) paid at the same rate regardless of how much or how little you drive. Bicyclists also cause orders of magnitude less wear and tear on city streets, thus imposing much lower maintenance costs. In the end, the maintenance of most municipal streets ends up being subsidized by those who drive the least. Motor vehicles have to be registered because they are a) expensive pieces of property and b) easily capable of inflicting massive damage on other expensive pieces of property (not to mention what happens when a human being gets struck by one). It’s important to be able to identify each individual vehicle and its owner so that responsibility can be assigned and restitution made in the event of a collision. Bicycles can be expensive, and pose some risks to life, limb and property, but not nearly to the same extent that is true of motor vehicles. Choosing to operate a more expensive vehicle (and paying the costs associated with it) does not confer a superior right to travel. Smog checks are necessary to control a harmful external cost imposed on the rest of society by motor vehicle operators (i.e., air pollution and its associated health effects). We don’t require smog checks for bikes because bikes don’t emit smog-forming chemicals. Choosing to operate a more polluting vehicle does not confer a superior right to travel. There are sales taxes on bike maintenance and repairs too. I pay sales tax on a new tube, on on a new bottle of chain lube, on the bill for the tune-up I get at the local bike shop, etc. It costs less than maintaining a car because my bike is simpler to maintain. Choosing to operate a more expensive-to-maintain vehicle does not confer a superior right to travel. I just realized I used the term “restitution” incorrectly in responding to point #3. “Compensation” is more appropriate. Gains-based recovery vs. loss-based recovery, if anyone cares about legal terms. Can’t do much about the cops (they are gonna break every traffic law there is cause they can get away with it), but the private citizens should be towed. Maybe the no parking signs are lagging? Winnetka isn’t properly signed yet. Amended Sec. 7, Ch. 127, Stats. 2001. Effective July 30, 2001. California Vehicle Code as written is a little weak as it relates to blocking bikeways; however,when a bikeway with classification of class II such as depicted in the photographs in the article are paired with “No Parking” (R26 (CA) signs as prescribed by the 2012 CA Manual of Uniform Traffic Control Devices Chapter 9 then the bikeways facility is easier to defend from such violations or transgressors of any type. Would these vehicles be allowed to park on a sidewalk? Or would this not be tolerated? to get an official response. I’ve already e-mailed LAPD regarding this matter to their Media Relations section a few days ago. Hopefully, with a response, I can do a follow-up story. This is a good argument for the adding some barriers or a curb to the buffer area that is supposed to separate the cars from bikes (or in this case, to separate the cars from bikes when the cars find it not too inconvenient). Of course it’s not OK for anyone to park IN the bike lane. This is impeding traffic, something that anyone else could be cited for. It’s as if they parked across the sidewalk, blocking pedestrians from using it as it’s intended. I suppose if they were on the sidewalk the response would be pedestrians could walk around. This is not acceptable, but it sounds like its a legal gray area.